Trust everyone, but always brand your cattle! It seems the only thing I know how to blog about anymore is branding. Maybe it is because that is when I get a couple of days off and get “caught up”! Well, another branding is in the books, and it was relatively uneventful compared to last year. There was a minor hiccup, when Macklee threw her friend Brody off the golf cart and he banged his head, but other than that a real pleasant day. It is work to feed America. However, we are so thankful to raise our kids on the ranch, where they learn to work hard, and to appreciate God’s blessings everyday. What a whirl wind week! It started out with a presentation I had been asked to give to the Chuckwagon Cowbelles, then there was my day job, night schooling some FFA kids in veterinary science, homeschool duties, and lastly a ranch sleepover for Dalli’s classmates! I hope I’m not too tired to continue typing! Creating the Cowbelle presentation was difficult. Usually when I create a presentation, I just put up impressive ranch views, tell about my hour commute (with no traffic), throw in a little veterinary medicine, of course a pinch of humor, and the crowd goes wild. However, with many of these women living on ranches with similar views, I had to dig deep! So, I focused on some of the problems plaguing (not plaquing for those of you who know my spelling is bad) our beautiful state, but more over our Nation. The one that bothers me the most is that only 1.5 percent of us help feed this nation. This is a profound fact. Depending on what source you use, estimates will go as high as 2 percent of Americans are directly involved in food production for the rest of the country! I knew we were a minority, but we are down right endangered. I tell the girls all the time that their dad has the VERY important job of feeding America. She (America) may starve without us! Ironically, 1.5% of us don’t mind the burden that we are faced with, we are quite passionate about it! It is easy to become reactive and emotional when we are consistently being attacked by something my friend Rodney calls the “ethics of the affluent”. If more Americans were involved in agriculture and had to worry about where their next meal came from it wouldn’t matter if it was grass fed or not. In other countries, like Nigeria up to 88% of their populations are involved in producing the food that feeds their nation. There are many romantic notions around what we do everyday (Holidays too!) but the reality is, it is hard work to feed America. As people become more removed from agriculture (and hard work) it shows up in many different ways. In my practice, I often see adults who have extreme difficulty coping with life and death. Life and death is part of ranching. Responsibility and consequences for your actions are mandatory components that seem to be lacking in our big cities. We probably do not have to worry about Bernie Sanders redistributing the 1.5 “percenters” more evenly because the rest of the nation doesn’t want to work as hard as we do. Appreciate the American Farmer and Rancher (the 1.5 percenters) we are working hard to feed you, doing the work that you don’t want to do. Off to make eggs for a group of giggly girls, beef for lunch, popcorn later, and milkshakes last night! We are doing our part to “Eat American” How about you? The next branding we went to they were able to practice some more. If these girls continue to be such a great flanking crew, think of all the money we will save on beer! So our branding started out resembling all the previous years, but quickly became memorable. I finished preparing breakfast, while David went to saddle horses. The Cowboys arrived and ate breakfast, then we hopped on our horses and set out to gather one of the pastures closest to our house. We had the pasture gathered and were pushing the mommas and their babies toward the house corrals. A couple of Cowboys kicked their horses into a lope to get ahead of the cows and hold them at water. This is where it all fell apart. 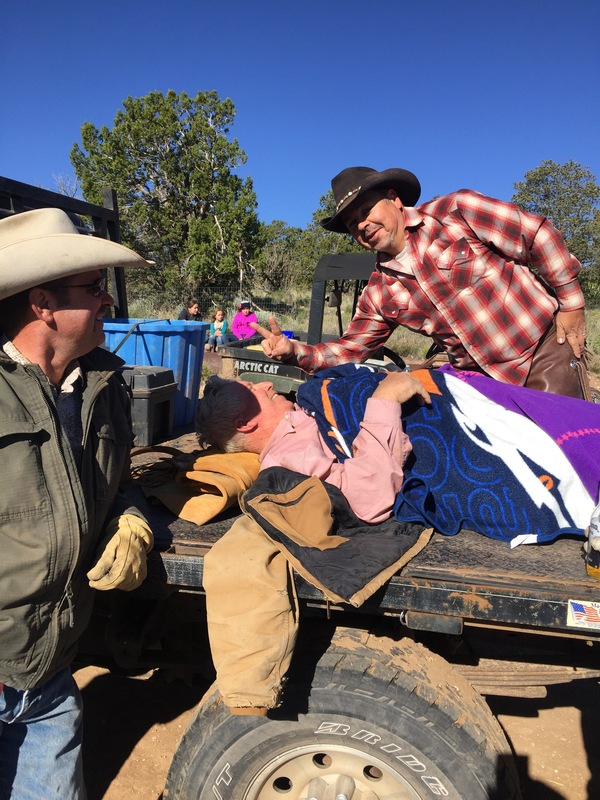 When Duane kicked Paint, it was a full fledged bronc ride. Paint apparently hadn’t had enough coffee or was it too much green grass on a brisk morning? Regardless, he bucked like a saddle bronc at the NFR, head between his knees the whole time. Duane rode him well, until he ended up on tilt. He hit the ground in a tuck and roll fashion. We knew there was a problem when he tried to stand, twirled around and collapsed back to ground. Magic and I kept him company while the Cowboys went to get the Artic cat to transport him. He knew his pelvis was broken as he could feel some grinding and it hurt to move his left leg. If he would have been whiny, I probably wouldn’t have been able to stay with him. But he was normal Duane, his sense of humor was definitely still intact! On a side note, I did do an excellent job of keeping Magic from trampling him further while we waited. We got a text to go through to his wife Shelly, but since I spelled his name Dewayne instead of Duane she wasn’t sure who I was talking about. When the Artic cat came we knew he couldn’t sit and sent them back for a flat bed pick up. Wayne and Randy finally arrived and we removed his pistol and chaps. He said he was missing a pen he had just acquired. With Wayne’s EMT expertise we were able to roll him onto a vest and zip it up to stabilize him as we lifted him. Wayne tripped and almost landed on him, and Randy had a hard time getting off he ground, other than that it went smoothly and we finally got him loaded. “Even if I scream keep going,” Duane coached. I galloped to the house and dialed “911”. “Where is he now? Don’t move him.” She quipped. Too late, I thought. He had a posse keeping him company while we waited for the ambulance. I told him I was glad he had eaten breakfast because they weren’t going to feed him in the hospital. He told me that he knew I had served quiche this morning and Cowboys don’t eat quiche. If I would have been quick enough on my feet I would have told him it wasn’t quiche it was egg pie! 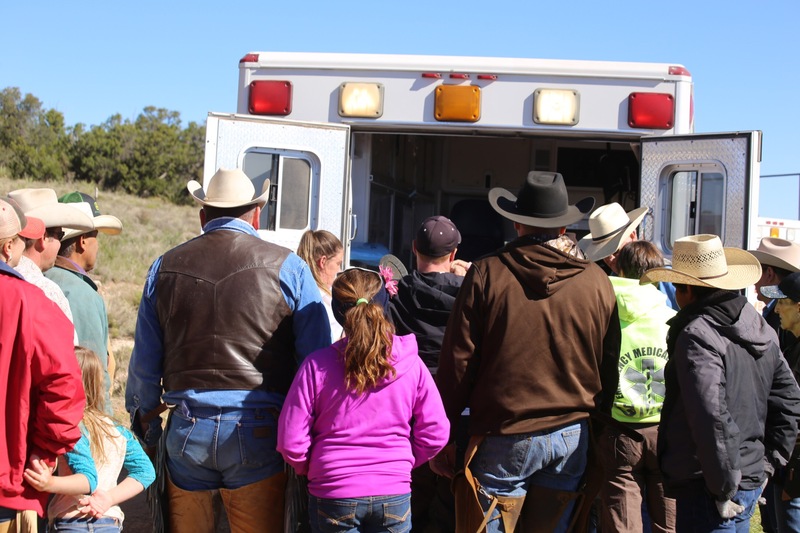 The ambulance carried him off all before we branded a single calf. The rest of the day went well, however a somber haze hung over us as everyone worried about Duane. He had pelvic surgery and is doing well, but will be wheel chair bound for the next 8 weeks. 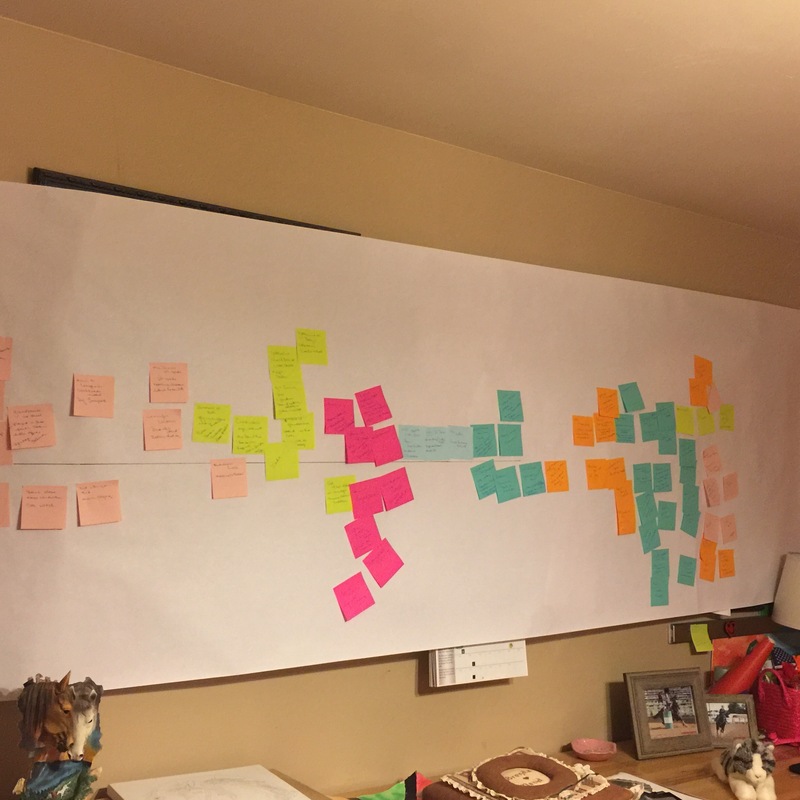 The outline was already completed, when I was invited to an author luncheon this weekend. It was a wonderful event. I sat with some great ladies from Hondo at lunch. I shared my aspirations with them and they didn’t even laugh. Yes, I am now sharing my aspirations with complete strangers. I even met Charlene Bell Dietz, the author of The Flapper, The Scientist, and The Saboteur. It is a great book, and she is the first author I have ever met in person. She talked a lot about the book, and some of the ins and outs of writing it. I left there inspired, thinking to myself, I got this. How hard can it be? Well according to my research, most novels are 80,000 words. So if you can hammer out 1500 words a week, you will be done in . . . . a little over 1 year! I am sure I will learn many things on this journey. I have already realized that I like organizing the sticky notes on the outline! I really like the organizing of most projects much better than the actual doing of the projects. I finally had to leave well enough alone and start typing. I didn’t stop until my tendonitis kicked in at 10,674 words! (not including those on this page) Stay tuned! Macklee is in California visiting Aunt Sandie this week, not sure if I would have made 100 words had she have been here! 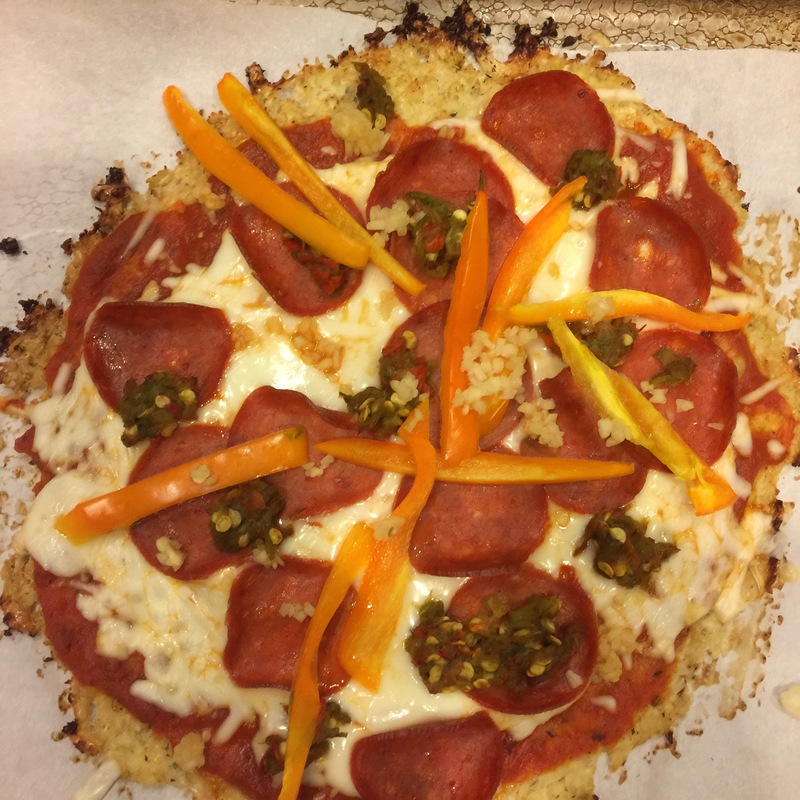 Tried a recipe for cauliflower crust pizza tonight. Not a do-over. A flour tortilla is a way easier pizza crust and probably just as healthy except for the gluten! It looked pretty though. out some new and old recipes. We made sweet potato salad, pasta salad, homemade granola bars, coffee ice cream. And if that wasn’t enough . . . our speciality oatmeal chocolate chip cookies! It is a good thing I don’t stay home often, I would weigh 300 pounds. Macklee gave the pasta salad “4 thumbs up”! We checked waters and made crosses! (I thought this would be simple, as that was the theme of the day!) Surprising more difficult than what my brain had envisioned! At the end of the day we made time for a rose petal and lavender foot soak. A beautiful, blessed and most importantly a simple day. 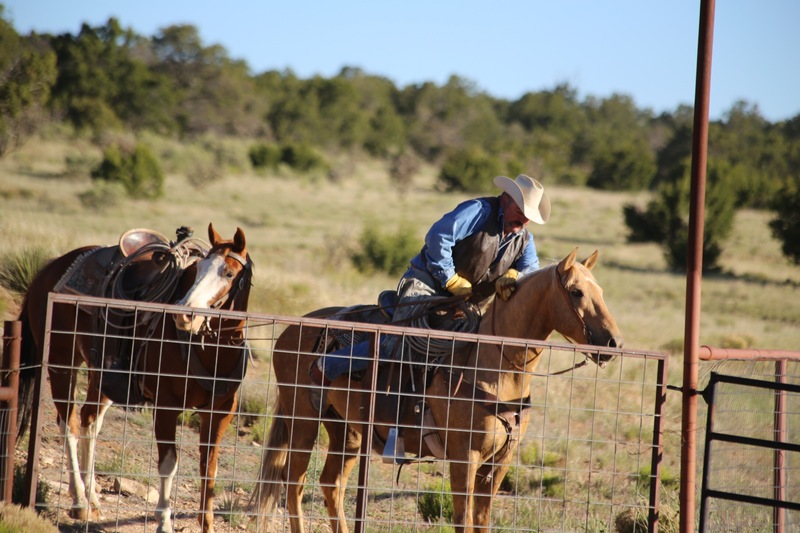 The cowboys that watch over America’s rangeland have such a huge responsibility that we take very seriously. Teddy Roosevelt said it best, ” A ranchman’s life is certainly a very pleasant one, albeit generally varied with plenty of hardship and anxiety.” While trying to do what is best for the livestock, the land, and our families we find ourselves constantly under attack from ignorance, environmentalists, market fluctuations, and drought. (to name a few) However, more than most we are blessed to notice our surroundings and strive to appreciate the awe and beauty of America daily, but especially on her birthday. Today we celebrated America’s birthday by scurrying to Capitan, NM for the Smokey The Bear Stampede Ranch Rodeo. The endless food included ribbon fries, brisket quesadillas, snow cones, and fresh lemonade. It seems that there is nothing more patriot than a rodeo. The colors are posted horseback as the Star-Spangled banner plays. The prayer is powerful, thanking Him for all our blessings and asking Him to watch over our cowboys, livestock, land, politicians, and of course pleading for a little rain. The celebration continued once we reached the ranch with smores and sparklers! We sure enjoyed your birthday.